Dr. Yves A. Gabriel has always had a strong attraction to the arts and scholarly activities. While playing collegiate football for Stony Brook University, Dr. Gabriel also completed studies for his Bachelors of Science in Biochemistry and performed numerous extracurricular activities which propelled him to the titles of Inter-Fraternity & Sorority Council President, Homecoming King and Student Ambassador. The latter is a distinction only provided to a handful of the 16,000 undergraduate students and allowed Dr. Gabriel to represent the university at several prestigious events. 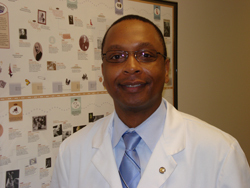 Dr. Gabriel received his medical degree from the State University of New York Syracuse College of Medicine. While there, he earned Honors in Embryology, Family Practice, OB/GYN, General Surgery, Cardiothoracic Surgery and Diagnostic Radiology. 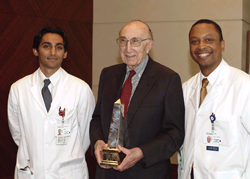 He also received the prestigious Bruce Farrell, MD Award for Surgery. Subsequently, he completed residency training in General Surgery at St. Luke’s-Roosevelt Hospital at Columbia University in New York, NY. While there, he also completed a year of research in Vascular Surgery. From there he went on to complete an Endovascular/Vascular Surgery Fellowship at The Cleveland Clinic Foundation in Cleveland, Ohio. Dr. Gabriel belongs to numerous professional societies and has trained with some of the most notable names in vascular surgery and vascular biology. Along the way, he has also had the opportunity to meet and receive career guidance from other distinguished surgeons such as Dr. Ben Carson (pediatric neurosurgeon) and Dr. Michael Debakey (pioneer of modern cardiovascular surgery).